After riding the alps for over 16 years we've now come up with this 7 day ride which offers the best of the best in fast succession. We start with the Swiss high alpine passes out of Andermatt, also known as the BIG SIX: the Susten, the Grimsel, the Furka, the Oberalp, the Neufenen and the Gotthard passes are amazing for quality of roads and views. We then move to the east across the amazing San Bernardino pass and, making base in Livigno, we tackle the Grison mountain passes and Stelvio. We save the best for last and from Livinio we head to Colfosco the heart of the Dolomites and enjoy these amazing moutnains. A truly amazing tour of only 7 days will knock your socks off!! 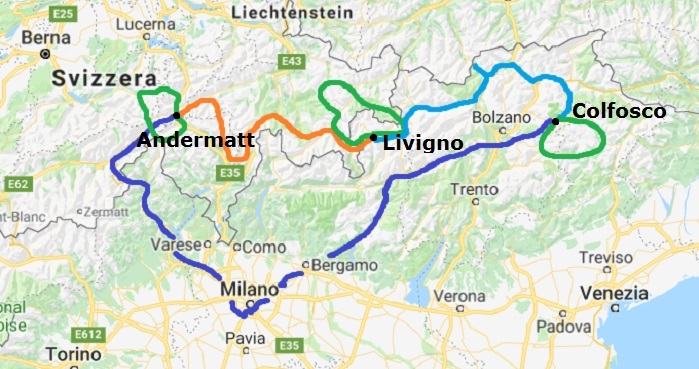 Day 1: we head out of Milan and aim for lake Maggiore, we ride the coastline of this lake until Domodossola and then hit our first Alpine pass the Simplon pass. We then run the Rhone river valley all the way to its source, the Rhone Glacier on the Furka pass that leads us into Andermatt, our home for the next two nights. Day 2: A fantastic day as we loop out of Andermatt and enjoy the pass hopping starting with the Susten then the Grimsel, then the Neufenen and finally up the Tremola (the old Gotthard pass) back into Andermatt. Day 3: We complete riding the BIG SIX by leaving Andermatt on the Oberalp pass. We then head south on the Lukmanier pass and then tackle one of the most beautiful passes in Switzerland the San Bernardino pass which leads you to the source of the Rhein river. From here the very fast Julier pass and the Berina pass lead us to Livigno for our next two night stop over. Day 4: Another great loop ride. We ride back over the Bernina pass (a road is completely different when ridden in the opposite direction) then ride the Albula and Fluela passes before taking on the Ofen pass to Santa Maria. This is where the third road up to Stelvio starts from. 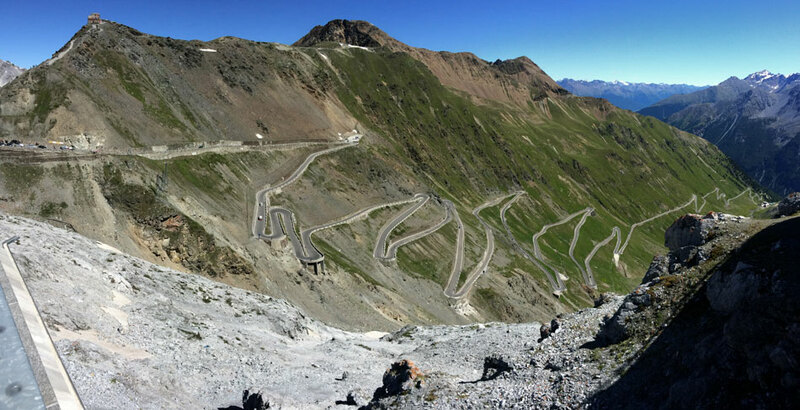 It's the Umbrail pass which leaves us just short of the Stelvio summit. We then return to Livigno riding down the Bormio side of Stelvio. Day 5: We head back over Stelvio and transfer to the heart of the Dolomites in Colfosco for our next two nights. Doing so we will ride the Jaufen pass and have a go at the Italian side of the Timmelsjoch. Day 6: a full day around the best Dolomite passes will leave an impression that will last forever. The most beautiful section of the Alps in our opinion. Day 7: our final day. We leave the dolomites and head back to Milano along the Passo del Tonale, but not before paying a visit to Lake Carezza, the legendary alpine lake.